The cold rain came in such heavy squalls that not a solitary star showed above the restless sea. One moment the wind howled like a tormented hound; the next it died to a sigh in the night. Nineteen miles off Cape Trafalgar, in the thin grey light that comes before dawn, silhouettes of twenty-six British men-of-war could be seen. They were all that stood between the hidden enemy fleet and a possible invasion of England. But where was the unseen Armada? In such an atmosphere of nail-biting tension, none of the British sailors on board dared wager what the morrow would bring. Yet Vice-Admiral Nelsons sixth sense told him it would produce . . . a battle royal! Four times during the past week hed predicted to Captain Hardy; The 21st will be our day! As dawn broke on that twenty-first day of October 1805, the rain suddenly stopped, the sky cleared, and the rising sun carved a pathway of burnished gold across the ocean. Only a heavy swell coming in from the vast Atlantic caused the three masted menofwar to roll slightly. Soon the white cliffs of Trafalgar would be seen on the eastern horizon, and already various lookouts were at their stations, eyes straining for a sight of land or enemy sail. When Nelson left his sleeping quarters on his flagship HMS Victory that morning, he was dressed as usual in his admirals coat, but for some reason he did not wear his sword. That still lay on his cabin table below deck. It was to be the one time he fought in a battle without his sword. As he joined Captain Hardy on the poop he was in excellent spirits, and ready to face whatever adventure lay before him. Such was his mood that he declared to Hardy; Today, I'll not rest content unless we capture twenty enemy sail-oftheline! Perhaps he was tempting providence, for within ten minutes of those words being spoken, a look-out on morning-watch, perched in the masthead of the HMS Revenge spotted a single sail on the eastern horizon. Enemy sail on the starboard bow! he cried. Three minutes later the same sailor called again. This time in alarm. Theres more than one ofem! Theres about forty of the devils! In fact there were thirtythree enemy ships in all; eighteen French and fifteen Spanish, under Admiral Pierre de Villeneuve, who commanded this huge squadron from his flagship Bucentaure. Soon, the eastern seascape was crowded with a legion of enemy masts bearing the colourful but ominous French and Spanish ensigns. It was the moment Nelson and the British crew had been waiting for, and hundreds of sleepy-eyed seamen scrambled up the hatchways to catch a glimpse of the hostile fleet. Admiral Villeneuve had received orders to leave Cadiz Bay and land troops at Naples to strengthen Napoleons waning military campaign in Southern Italy, but for some time he had hesitated before attempting to pierce the blockade of British ships. His orders were not to go in search of the enemy. But if his fleet should meet the British warships then he was to fight to the death. Already the great Napoleon Boneparte had insulted him, calling him a coward. Well, he would show his Emperor; and what better way to do that than with a decisive victory over the British squadron? 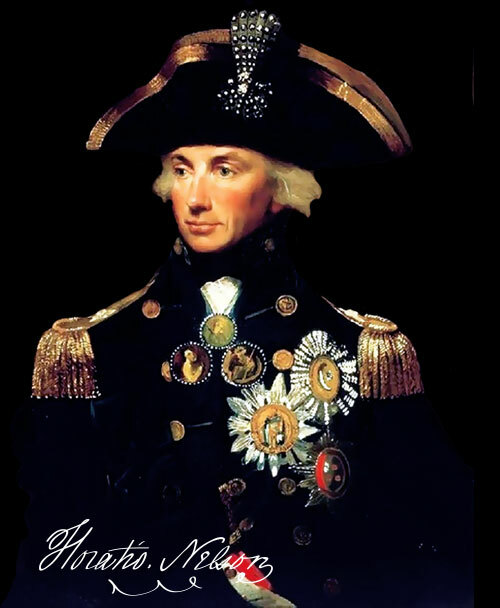 So far there had been many encounters between his own ships and those of Lord Nelson, and each time because of successive setbacks, Napoleons plans to invade England had to be delayed. But now, if Villeneuve could crush the British war-dogs once and for all, then surely a victory would open wide the floodgates for a full-scale invasion of England. The French Admiral looked through narrowed eyes at the distant British fleet showing indistinct in the morning light. He estimated in his own mind that with the gentle northwest wind continuing to blow against his own ships it would take five hours before the rival squadrons would be close enough to engage in battle. Plenty of time to prepare. Time to call his captains together and remind everyone of them of their duty; especially the Spaniards! Vive le Empereur! Six miles across the waves, on board HMS Victory, Lord Nelsons order was to hoist the signal, The British fleet are to sail in two columns. Owing to the squalls of wind overnight, many ships had lost way. Now they began to close up and form two columns as part of Nelsons pre-arranged battle-plan. Although the confrontation was still hours away, the gun crews began checking canons and bringing ammunition up from the magazines. Marines were cleaning their muskets; some of the men thinking what would be their last thoughts of their wives, children and sweethearts. Then they waited; tense and apprehensive as time ticked relentlessly away. One captain turned to his first lieutenant and calmly advised; Youd better wear silk stockings like me, for if you get shot in the leg it will be so much more manageable for the surgeon. At 9.30 a.m., the enemies were five miles apart, each ship showing full sail. British officers met over breakfast, but few could eat. There was a nervous expectancy in the air. Final plans were laid, for better or for worse. Then came the sound of the drum, beckoning the men to their posts, a little light headed after their pot of beer. The ships of the combined fleets of Spain and France could be seen clearly now. Some flying the tricolor, others the red and yellow ensigns of Spain. At about eleven oclock, the black snouts of the enemy guns slipped into view. Some of the Frenchmen were three-deckers, showing a terrifying one hundred and twelve guns. Young British hearts quailed at the sight. But the more experienced salts merely grinned. Theyd seen it all before. Someone called for a shanty to be sung and the sound of salt water ballads floated over the rippling water. Soon it would be the hissing noise of canonballs whipping through smoke filled air, the heaviest of which could smash right through three feet of solid timber, or leave a hole the size of a small football where a man stomach had been. Then there was chain shot, two half canonballs, to be fired at the rigging; or the raking grape-shot which could maim a dozen crew members in one firing. One hour more and all kinds of devilish destruction would be let loose. Lord Nelson knew full well the fervid heat of battle. At Cape St Vincent he had directed his ship into action, alone and unsupported, and single-handed held two Spanish squadrons apart. At one time he was fighting seven enemy ships. Not content with such heroics, he managed to board and capture one enemy brig, and then from her deck board and take yet another! 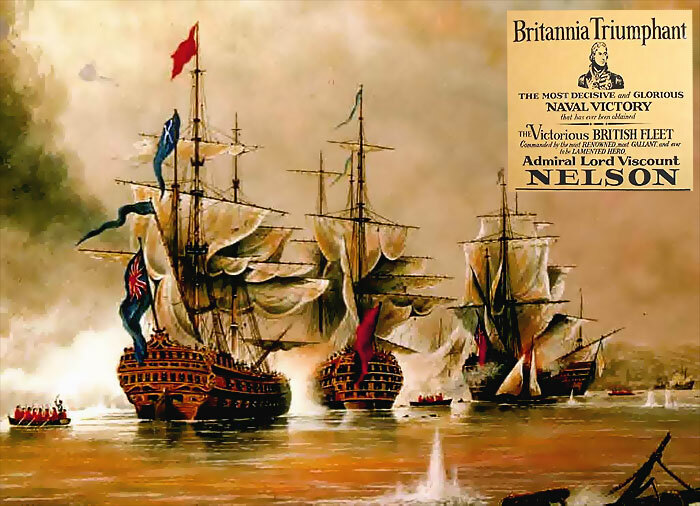 The Battle of Cape St Vincent had earned Nelson a Knighthood but all was not plain sailing in his naval career, for in his very next action, whilst engaged in an assault on Tenerife, a grapeshot smashed through his right elbow. Below the decks of his flag-ship in stifling heat, the arm was amputated. 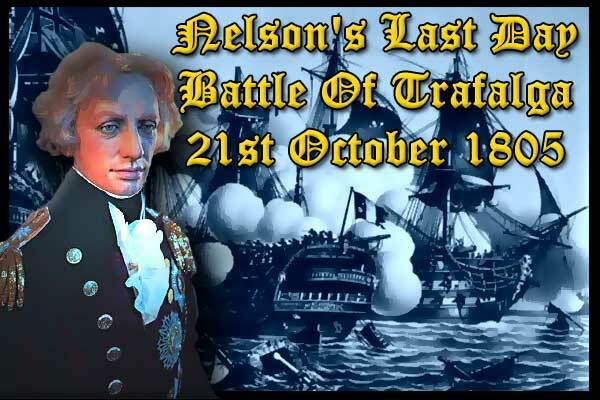 Nevertheless, further successful campaigns followed his recovery, and even before the approaching Battle of Trafalgar, Lord Nelson was Englands most lauded hero. Such a man as Nelson had destiny on his side. He commanded respect from officers and men alike. Every decision he made had to be carefully weighed, for its effect would be far reaching. Naturally he made mistakes, but these errors were by far eclipsed by his triumphs. However, his next decision on that sunlit morning off Cape Trafalgar was to prove most fateful. He decided that his own flagship HMS Victory would be first to break the enemy line. Captain Hardy was appalled! He pointed out that Nelson, as the fleets commander-in-chief would be exposed to every possible danger. Not only canon and grape-shot, but musket fire too! But Nelson was absolutely convinced that only while he was at the head. of an attack, could he exercise full control over the British squadron. He was adamant, and Hardy soon realized that further argument was useless. However, the Captain did point out that his commander made an excellent target for snipers, and he indicated the bright stars upon Nelsons splendid uniform, suggesting that perhaps His Lordship might change his coat? I agree Hardy, returned Nelson, as he gazed upon the converging enemy. But its too late now to be shifting a coat. Then he turned calmly to his signals officer and ordered a communication to be sent to the whole fleet. It was the immortal message; England expects that every man will do his duty. The very next order was; Prepare to engage the enemy in close action! By now the French and Spanish ships were 6oo yards away and advancing menacingly in the battle formation of a crescent as if to swallow up the British fleet in a crushing pincer movement. Their broadsides turned to reveal rows of deadly iron barrels, ready at a given signal to discharge tons of venomous shot. Painted all colours, some ships had yellow sides, others blood red. A few were funereal black. Many sported decorative ribbons between their coloured decks. Some had carved figures on their prows. All looked proud, graceful and deadly, like cobras of the sea. At twelve noon the first broadside was discharged. Abruptly one French ship, the Santa Ana was towering over the British Royal Sovereign like a sword of Damocles. Yet miraculously, within a few minutes, the British guns had brought the Santa Anas masts crashing down. Across the two fleets it was the same grisly tale of destruction. On almost every deck: Fire! Death! Headless bodies. A living nightmare. Flying splinters and grape shot. The stink of burnt flesh. The shrieking agony of wounded men. Disfigured corpses scattered everywhere, and the soft moans of the dying. This was the hideous outcome of war, and soon the salt waters were streaming with the blood of three nations. At one broadside a hundred men would be shredded into mincemeat, with ropes and tackle lying in a twisted mess across the decks. The once varnished sides of the men o war were now puckered with shot; the wounded piled high and already there were as many dead as would sink three barges. The surgeon was the busiest man on board ship and if he died then God help the wounded! In one private confrontation HMS Revenge had been rammed by a Spanish three-decker. The Spaniards bowsprit hung over the Revenges poop, with a whole party of men in her fore-rigging ready to board. Only the British marines with their rifles and carronades saved the day. But at that instant, with one minor battle won, a two-decked French ship appeared on the Revenges starboard side while on the larboard bow yet another. Yet luck was still with the British ship for many of the French gunners shots struck their own ships, killing and wounding their compatriots. Meanwhile, on board HMS Victory, death was already waiting in the wings for the gallant Nelson. He had but two hours to live. As his flagship attacked the enemy formation, the French and Spanish guns began an incessant raking fire. A shot struck the quarterdeck and passed between Lord Nelson and Captain Hardy. A splinter bruised the Captains foot and tore the buckle from his shoe. Realizing that Hardy was not badly injured Nelson observed: This is much too frantic to last for long. The Victorys mizzen mast was now gone. All her studding sails shot clean away. Thirty lay dead amidst the flying shot and thick acrid smoke. Nevertheless, Victory steered resolutely for a small gap in the enemy line. Passing directly between Admiral de Villeneuves Bucentaure, and the Frenchman Redoubtable, HMS Victory was at the mercy of both her protagonists guns. But with a defiant gesture, Victory fired double and treble shot into Villeneuves great cabin windows, passing so close to the Bucentaure that her main yardarm caught in the French leaders rigging. All her guns blazing, Victory pulverized the French commanders ship, putting at least thirty of her guns out of action. On the Frenchmans decks the dead were thrown back in heaps, with fresh shot further mangling the already mutilated bodies. With Bucentaure behind her, the Victory moved into line with Redoubtable, and smashed the enemies masts to smithereens with devastating starboard broadsides. Now the English Tetnera ire joined the fray. Following the Victory, she was soon stationed on the opposite side of the Redoubtable, with the French Fougueux on her starboard bow. Four men o war, two from each side were locked together in murderous combat. Muskets spat from the masttops of the Redoubtable, decimating the Victorys crew. Scarcely a sailor on the Victorys foredeck escaped injury as Tyrolean snipers cooly picked off man after man. So close were the ships that there was the awesome prospect of the Redoubtable catching fire from the Victorys blazing guns and the possibility of the flames consuming both Victory and Temeraire. With scenes of carnage on all sides, and the Victory filled with so many holes that she looked like a floating colander; Nelson ordered his marines to open fire on the snipers. The canons joined in this barbarous return of fire. Suddenly Redoubtables main-mast swayed, seemed to falter, then came thundering down to smash across her decks. Only seconds afterwards her stern was stoved in. The rudder was fractured beyond repair. All the guns were broken or dismounted. Both sides of the ship were shattered. Most of the pumps were useless and the ladders which connected the decks were in ruins. Those same decks were littered with the victims of war. Yet still the survivors stubbornly cried; Vive le Empereur! Vive le Empereur! At 2 p.m. the French ship was so badly holed that she was in danger of sinking. At last her captain decided to surrender, ordering the colours to be hauled down. But even before this could be done with dignity, the main mast had crashed to the ground. Nearly 500 of Redoubtables crew were killed or wounded already and she was to have the worst casualty list in the battle. Now, all over the frenzied waters, French and Spanish captains began striking their colours. Once Victory had broken the enemy line, it signalled the beginning of the end of the enemy. Through blankets of thick smoke, fire balls descended. Men fought blindly on, others looked to survival. Nelson walked the Victorys quarterdeck in the midst of that raging holocaust alongside Captain Hardy. He was in the act of turning. His eyes were directed towards the stern of the ship. Then the fatal musket ball was fired from the enemies mizzen top. The ball struck the badge on his left shoulder and bit deep into his chest. He fell face down upon the deck. As Hardy approached, Nelson cried, They have done for me Hardy. My backbone is shot through! Captain Hardy immediately ordered two seamen to carry the Vice Admiral below. But before he left the deck Nelson still had the presence of mind to give an order regarding tiller ropes. He then covered his face with his handkerchief in the hope that his crew would remain ignorant of his injury. But within a minute, the news was all over the ship. Lord Nelson had been hit. In spite of this disaster, the great man had done enough. . . The tide of battle had turned. In a dim illumination cast by lantern candles, Nelson passed his last minutes. The Surgeon, Mr Beatty approached him and removed the handkerchief. Nelson looked up and muttered. Mr. Beatty. You can do nothing for me. Attend to the others. Beatty replied: I hope the wound is not as bad as Your Lordship imagines. Nelson answered feverishly. Doctor, I told you I am gone. Beatty probed at the wound in the half light. But when he discovered no injury to the skin of the Admirals back, he realized that the musket ball must have lodged in the spine. He then inquired how His Lordship was feeling. I experience a gush of blood every minute within my breast. said Nelson. I cannot feel the lower part of my body. I can hardly breathe. I believe my back is broken. These symptoms told Beatty that the wound was fatal. Although he tried to cheer his Admiral with hope, Nelson was not to be fooled. He sensed life ebbing from his body. But there were still questions to be answered! He had to hold on long enough to find out. He must speak with Captain Hardy. Will no-one bring Hardy to me? he moaned. He must be killed? Surely Hardy is dead? But Captain Hardy was not only captaining the Victory, but also conducting the battle on behalf of Nelson. He would, he said, come below as soon as his duties allowed. An hour gone and Hardy was at last bent over the broken body of Nelson. Well Hardy. How goes the battle? Very well my Lord, answered Hardy. We have fourteen of the enemies ships in our possession. I trust none of our ships have lowered their colours?! cried Nelson. None, my Lord. Not one. replied Hardy. In the eerie quiet following the clamour of battle, the young midshipman of the watch on board HMS Victory pencilled in the log. Partial firing continued until 4.30, when a victory was reported to the Right Honourable Lord Nelson. He then died of his wound. So Nelson had been right. The 21st had been the day, a day of victory that became immortal.